MWN Blog: Warm temperatures are back, but what about rain chances? Warm temperatures are back, but what about rain chances? 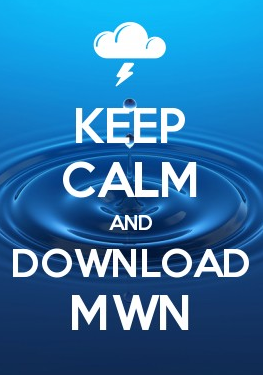 Welcome to MWN Blog post #950! After a stretch of below normal temperatures for the last few days in the Mid-South, the warmth came back in a hurry over the last 24 hours as strong and gusty southwest winds sent the numbers back above the 80 degree mark, with much higher humidity levels returning as well. It looks as if the warmer weather will be sticking around a while, but is there any significant rainfall chances in the offing as the Memphis area now approaches an 8-inch rainfall deficit for the year? While a few weak systems have brought isolated to scattered rainfall to the area over the last several weeks, the last significant and widespread rainfall (greater than an inch) was way back on March 16! This pattern is in sharp contrast to one year ago this week, as a multi-day historic severe weather outbreak and flooding event began to unfold across the Mississippi Valley and Southeast U.S. Looking ahead, a cold front will be approaching from the north on Thursday. Unfortunately, the cold front looks to stall just north of the area, meaning the best rain chances may again avoid the metro area. Nevertheless, as the front makes it closest approach late Thursday afternoon through Thursday night, a few thunderstorms may develop and drift into parts of the area, with those north of I-40 having the best risk of seeing rain. Still, significant and widespread rainfall is not expected during this period. WRF Model for Thursday evening. 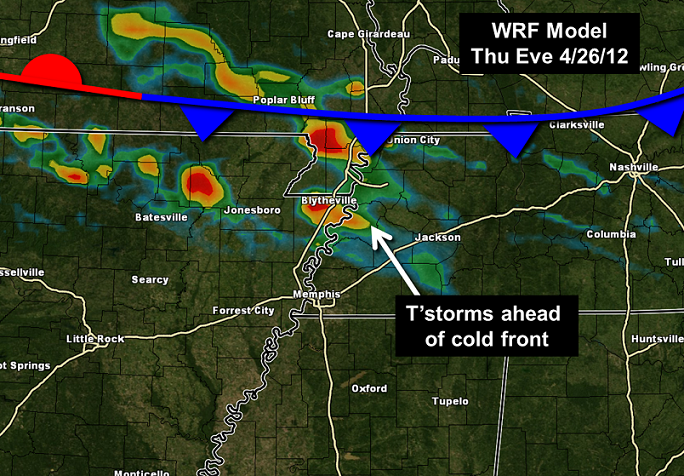 Scattered t'storms will likely be ongoing near front, with best chances north of Memphis metro. This front will meander north of the area through Friday and Saturday, likely keeping conditions dry here though an isolated risk for a shower or storm remains. The front will make another push into the area on Sunday, and models are showing a bit more progress on this attempt, meaning our best rain chances arrive then with scattered showers and thunderstorms possible. However, it again doesn’t appear to be shaping up to be an event that will put a major dent in the growing rainfall deficit. NWS weather forecast map for Sunday morning, with near-stationary front close to metro, bringing our best rain chances. Finally, in a reversal from thinking a few days ago, this front then looks to lift back north of the region at the start of next week. This means a cooldown earlier thought possible appears off the table, with temperatures for the next seven days reaching the 80s and mild overnights expected as well. More scattered rain chances may enter the picture around next Tuesday and Wednesday, but we may be waiting for next widespread one-inch or greater rainfall event for a while longer. Stay with MemphisWeather.Net for the very latest on rain chances in the days ahead. You can find the full and updated forecast details on MWN's forecast page.